Combined cycle plants generate power through an assembly of heat engines working off of one source of heat. This enables a combustion turbine facility to generate 50% more power output from the same amount of fuel that would be burned in a simple cycle combustion turbine. To do this, they incorporate many components that work together to produce energy. This subject area reviews major plant components and auxiliary systems, combined cycle configurations, the Brayton and Rankine cycles, turbines and condensers, and the operation of HRSGs. Whether for the production of power and heat or the transport of oil and gas, gas turbines are widely used for combined cycle applications. The Gas Turbine subject area introduces the basic theory of operation for gas turbines and the common terminology used to describe their operation. 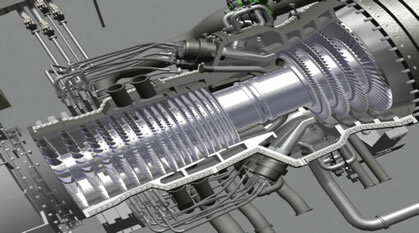 Additionally, this subject area provides an overview of the major components and systems of a gas turbine, including the air inlet, fuel and oil, combustion control, fire protection, and water wash systems. The basic function of the HRSG is to remove useful energy in waste heat from a gas turbine, or from some other combustion process, and transform it into steam energy. This steam energy can then be used to drive a steam turbine, produce electricity, or supply steam to a host for other purposes. This subject area provides an overview of HRSG operation, which is a critical factor in achieving high thermal efficiencies in a combined cycle plant. Some of the additional topics covered in this area include the theory of operation for HRSG drums, blowdown system components, duct burner and SCR components and operation, and the different parameters of boiler water chemistry. Balance of plant is a grouping of equipment, such as the condenser and the condensate system. The term comes from balancing the amount of feed flow for the HRSG to the amount of steam flow from the HRSG in order to maintain a constant water level in the HP, IP, and LP drums. This subject area provides an overview of balance of plant basics and describes common terminology applicable to the balance of plant. It also reviews the theory of operation for different types of steam systems, major components of a feedwater system, the components and operation of different water and gas systems, and the theory of operation for an instrument/service air system. Generators driven by steam turbines furnish the bulk of electric power generated today. The turbines are supplied with energy in the form of heat energy in the steam, and they convert this into useful mechanical energy. This subject area provides an overview of steam turbine terminology and operation, steam turbine components and flow path, bearing theory of operation, and major condenser components. Additionally, these modules introduce the function and components of vacuum systems, steam turbine support systems, and steam turbine oil systems. This subject area provides an overview of how electrical power is generated within a combined cycle plant and then subsequently distributed. The modules in this topic begin with a discussion of generator operation, including the different types of cooling systems used in generators. The subject area then moves on to introduce switchyards, which provide the foundation and support for the conductors, insulators, circuit breakers, disconnect switches, and other equipment. In addition, the different types of relays used for generator protection are discussed. Heat rate is the common measure of system efficiency in a power plant. The heat rate is a measure of the combined performance of the gas turbine cycle, the steam turbine cycle, and any other associated auxiliaries. This subject area introduces the basic characteristics of heat rate and provides instruction on how to calculate heat rate, including formulas and conversion factors. In addition, the modules in this topic discuss the effect of heat rate on the HRSG, gas turbine, steam turbine, condenser, and other applicable plant equipment.